Pingback: No kitchen recipes – I like grapes. Do you think this would make a good meal prep dish?? 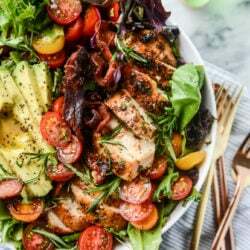 I’m always searching for new salads to prep for the week and this sounds so dreamy! I don’t eat bacon – any alternatives for what to cook the chicken in?